3rd Annual NC Downhill Race at Mount Jefferson - Emily Pross Takes the Title! Home >> Mount Jefferson State Natural Area >> Park News >> 3rd Annual NC Downhill Race at Mount Jefferson - Emily Pross Takes the Title! The 3rd Annual NC Downhill Race at Mount Jefferson brought about several firsts. A free-ride day was added to the event, providing an opportunity for additional riders to try their skills on the mountain. A luge class was added with 12 registered riders competing in classic luge (buttboarding) and street luge. The first and biggest story of the event has to be Emily Pross taking the title. This is the first time a female racer has taken the title in a major sanctioned downhill event in an open class. 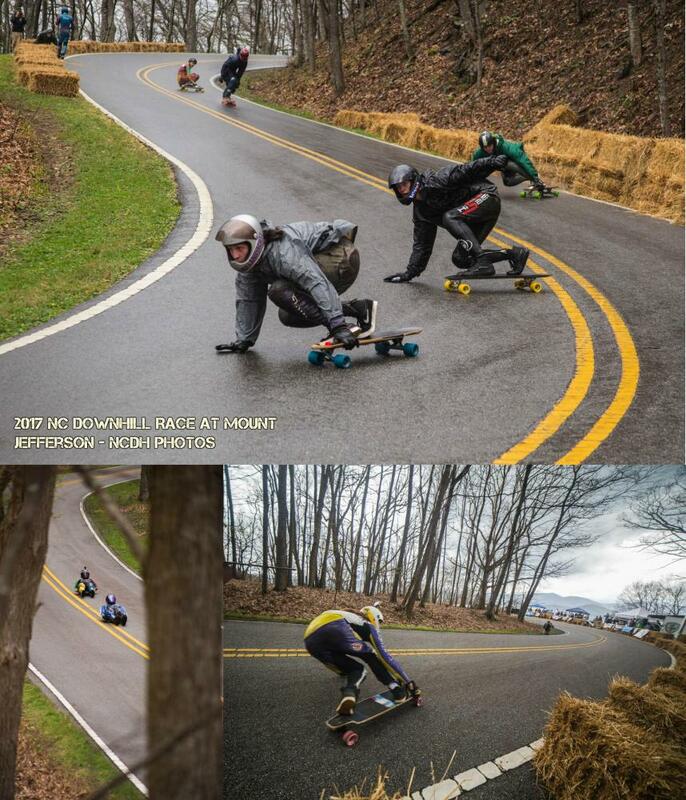 The NC Downhill Race at Mount Jefferson hosts longboarders at speeds of over 50 mph. The event is organized by NC Downhill and the Human Powered Transportation Club of Appalachian State University in coordination with NC State Parks. As with any event with this type of risk, safety is of utmost concern. The Ian Tilmann Foundation helps to ensure a safe event by coordinating several safety components One such element is distributing 126 S-ONE skateboard helmets during the weekend's events for free, made possible by a generous donation from Benning Construction of Atlanta, GA Other sponsors supplied support including the local business, Ashe County Cheese. This is truly a community event with coordination among several Ashe County entities including Ashe County Schools, Parks and Recreation, County Commissioners, County Manager, Economic Development, and Ashe County Rescue.